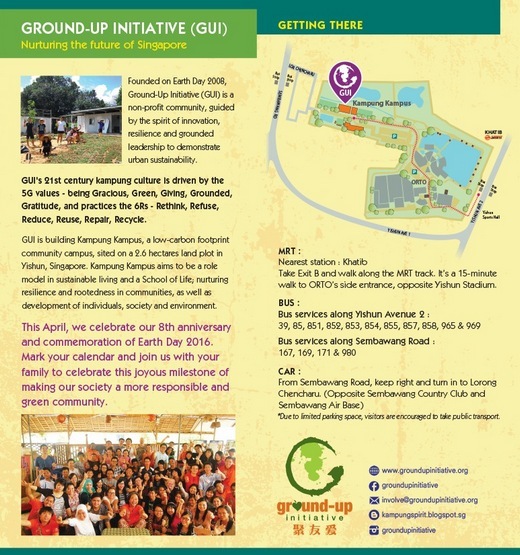 On the 23rd of April, GUI will be celebrating its 8th anniversary and commemoration of Earth Day 2016 in an Open House event called “Magical Kampung”. This year, GUI welcome all guests and hope that members of the community will be able to join in celebrating this milestone. GUI has come a long way in its efforts to promote a more responsible and green community, and will continue needing the support of the larger community to help grow further with true 21st Century Kampung Spirit! Immerse yourself in the kampung spirit and culture, while you reminisce those carefree kampung days that were once upon a time. Create art from nature or experience the hustle and bustle of the mini bazaar with your loved ones. Discover GUI’s 21st century kampung grounds through an interactive Kampung tour, and participate in numerous customized workshops and activities that are tailored for all ages. Mark your calendar on April 23rd and join with your family, friends and loved ones to celebrate this joyous milestone of making the society a more responsible and green community. Calling for Volunteers for Chingay 2017!